I think there's a gremlin in my internet connection. I've been hitting F5 all day to read the normally very quick and witty responses of TWB's board, but until now the silence has been absolutely deafening. 1. What checks and balances does TWB use to avoid conflicts of interests? How is transparency ensured in projects in which both TWB (the non-profit organization) and the for-profits represented in TWB’s Boards participate? If there is a written policy, could you share it, please? Then there is my Board and my Advisors. When we were still a small organization, the crisis in Haiti showed me that I needed to work with a group of smart people to show me how to scale Translators without Borders so we could do more. Yes, they have day jobs, as do I. That doesn't make them reproachable. My day job, as the owner of Lexcelera, and LexWorks, is what pays for the massive amounts of time I spend doing Translators without Borders work. This is also true of my Board. And their day jobs as company heads and localization executives is exactly why I need them to help me scale Translators without Borders to do more: they are highly experienced, and highly professional. I need that. They are another reason why I find these attacks so hurtful. I worked all weekend with my Board, until around 5 pm on Sunday. 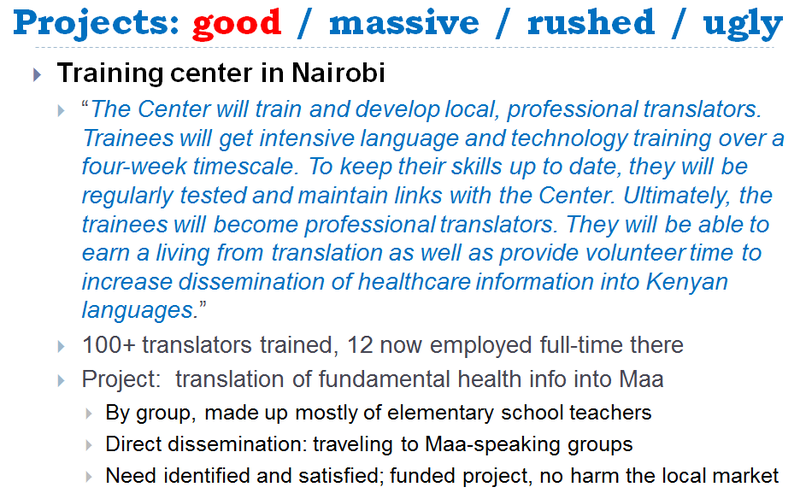 They give their time so generously because they too believe we can use translation to make the world a better place. This response by Ms.Thicke is exactly why I think the questions that Kevin Lossner has raised (at worst I can only see that he was perhaps not politically correct in his initial comparisons) are valid and need to be asked. This organization (TWB) has become a platform for self-righteousness and "look how noble I am" for Ms. Thicke and her commercial interests, and personal self aggrandizement, rather than any true and real selfless contribution. I think this post and the challenges made therin will at least raise key questions in the minds of enquiring minds, and that can only help the long-term viability of the organization. I have often felt that the people that "give" the most in the TWB context are the volunteer translators (also the most invisible) but the person who repeatedly takes the most credit for the contributions is Lori Thicke. The number of times that translators are congratulated and thanked for their contributions are significantly less than the number of times we are subjected to self-congratulation from Ms.Thicke and her blog. I think it is not so unreasonable to suggest and question that perhaps the real motivation for Ms.Thicke and at least some of her board members is self promoting PR and not anything else. 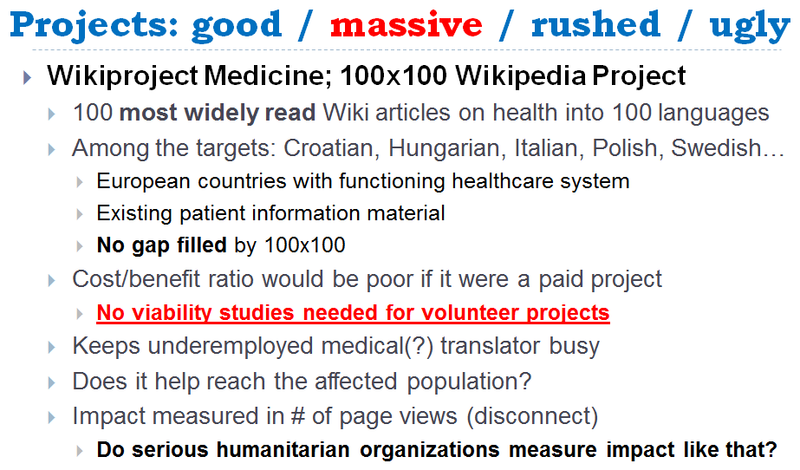 It would be refreshing and motivating to many volunteers to see a board that was more representative of the volunteer base that was involved in doing the translations, who also had a say in the prioritization of the work that is done. A real mission focused board would not be concerned at the kinds of questions being raised in these blog posts and I am glad to see that somebody still does. Much of the response from TWB representatives has been focused on how dare you question our nobility and motivations rather than sharing the actual process by which work gets chosen, who gets credit for it and how processes are setup to ensure that the most worthwhile works gets done first, even though no administrator or board member can get a press release out of it. I think TWB would be much more credible if it was actually run by a group of key individuals from groups like ATA + GALA rather than be a platform for self promotion by Ms. Lori Thicke. And I think volunteer translators should be asking and expecting answers for several if not all of the questions that are being raised here by Kevin Lossner and others. Someone shared an interesting article on psychological research after reading the rather emotional responses from the TWB board and its proxies. This quote describes the situation fairly perhaps: "Individuals who are sensitive to justice and fairness do not seem to be emotionally driven”. I have seen similar situations often enough that I cannot help but think "thou doth protest too much". Congratulations. You failed to address even a single point raised in this blog post. By now we've heard a dozen times that the people in TWB's board are so divine, good-natured and unselfish that they're currently in the process of growing angel wings. Thing is, that was never the issue neither the question. I recommend you go back to the drawing board and answer the questions raised instead of performing another act of selective indignation. It's getting old very fast. Congratulations, Lori. You have failed to address yet a single issue raised in the above posting. Yes, by now we know what incredible great work TWB has done, and we applaud you for that. It has only been stated a hundred times or so. That however, was never questioned. Whether TWB is good or bad, is entirely irrelevant. Some of the work TWB does is good and no one has ever denied that. But why, Lori, why all the promotion? Proclaiming everywhere how good you are, especially on your corporate website, defeats the whole purpose of being good. Because you're no longer being good to be good, but you're being good to get something in return, namely free promotion of your company. In fact, the people in TWB's board have found a great and relatively cheap way to advertise their services, not even because of the hours they invested in TWB, but because of the hours they had others invest in TWB: the translator army that is working for them for free because they believe in your PR, I mean your good cause. Whether the people in TWB's board are good or bad *may* be relevant: some people would definitely not support an organization that has Roper Murdoch in its board, and some people would definitely not support an organization that has Moravia or Proz in its board. Hence the comparison with people who exert a huge influence in the media: there is a huge conflict of interest and the fact that the organization is a non-profit organization does not change that. But *is* the organization a non-profit organization? Besides the fact that the organization is being used as a cheap PR vehicle, somehow and someway a EU grant of 2 million *may* have been used to have volunteers translate Symantec's corporate marketing for free. The Red Cross has been under fire for far less. This is a valid question asked, and until now it has only been answered by self-righteous indignation and threats with legal action. If that's the only answer you have, I will draw my own conclusions. I will never, ever work for TWB. I refuse to work for the greater glory of TWB's corporate board. There's only one company I work for, and that is my family. And I'm sure that someone will twist that in such a way that it's my fault that all the poor little children in Africa are dying. I know better. I do community services too, probably more than anyone in TWB’s board. I just don’t plaster it on my website. Loek & Attila - can you tell me where the question about Symantec having volunteers translate the company's marketing for free has come from? I've browsed the project deliverables & reports on the ACCEPT site, but can only find reference to user forum posts being pre-edited by Symantec's own user community then undergoing SMT using a Moses engine built with Symantec's existing TMs (product materials) and then being post-edited by the Symantec user community. It looks, too, as though the TWB materials have undergone similar, but separate processes with TWB's own volunteers (who knew what they were participating in), and the two communities are entirely separate. At the moment I am struggling, so can you please help me understand your questions around the ethics of TWB being involved in this research project? By the way, in my comment on the other blog post I ascribed to Attila a fundamental dislike of large translation companies that may not reflect his views, and I'd like to apologise for my misunderstanding of his position there. It would be nice if others who have contributed to this discussion, not only by commenting on these blog pages, could also reflect on their use of language and allusion and consider whether it has always been appropriate, perhaps also taking time to apologise if they now understand the hurt that has been caused. Iwan, before going into the details of Symantec's texts, let me ask you a question that is, in my opinion, more important. Do you think it is reasonable to ask TWB to show what checks and balances they have in place to avoid conflicts of interests in projects like ACCEPT? Part of the training material was Symantec’s user forum. Another part was for material related to TWB. I did not mention the extent of overlap between the two post-editor communities (see the slide). Other questions may be more important here. I'm looking forward to reading your comments in http://www.translationtribulations.com/2014/11/translators-without-borders-accept.html , Iwan. Right. Well, I'll chime in then, is a slightly unrelated manner to the project “categories” Kevin Lossner posted above. Allow me to present my experience with TwB in the role of quite possibly the worst volunteer they ever had. I did a paltry 1200-something words for them, 2.5 years ago. I delivered my thin slice of the project two days late (but I think I was not the last one to arrive at the party), and being a novice back then, and only slightly more experienced now, I actually did a somewhat less than good job at what was a project for educational materials for use in a developing country. Let me be clear. At this time, I knew NO ONE in the industry. I had no idea who was what, who worked where and whatever else you may think of. I was blissfully oblivious. Only after traveling, attending meetings, shaking hands, drinking copious amounts of beer and having a generally good time with other fellow translators did I realize that there was this TwB controversy. Now, by now you may have either disconnected and moved on, or thought "wait a sec, why did you stop doing any volunteer work for TwB?". You see, my problem was unbiased by this discussion now happening - hell, I didn't even knew translators blogged profusely. My problem was with the content I saw on the project I was involved with, or rather, the apparent lack of oversight on said content. So there I was, with my volunteer cape draped on my shoulders, doing the good deed when I am faced with a content that in subtle and not so subtle ways promoted something that my conscience could not bear. I did the job, delivered the work. I subsequently explained why I thought praising, or at least, offering a biased view of that specific subject was unacceptable to me. I got my reply back, and was forever convinced that it would not be my place to raise objections to the contents accepted by TwB. My only option would be to ignore said projects/documents. And so I did, and the whole way of thinking behind it. You see, this was likely a rusty needle in a haystack of good projects. But what I have experienced killed TwB for me. Your rules, I chose to stop playing. I wouldn’t be working that way if I was paid to, much less for free. I don’t think I need to say anything about having corporations mixing it up with non-profits using masses of volunteers - each person seems to have already made up their mind about the subject. I am, however in the not so unique positions of not knowing any of the people involved personally or otherwise. And the only thing that crosses my mind whenever this comes along is an old Portuguese saying: “Á mulher de César não lhe basta ser séria, tem de o parecer”. This is a linguist’s blog, go figure out what that means. P.S. : Judging by the mere description of the ACCEPT project on http://cordis.europa.eu/project/rcn/101285_en.html , I wouldn’t touch it with a barge pole. It seems to have compiled all the "bad" buzzwords into one entity. Tiago doesn't mention it here, but we're talking about some content praising Robert Mugabe and damning "the West" as the source of trouble in the region. I nearly fell out of my chair when I read some of the content. My God. If this is doing good, I sure as Hell do not want to know what bad is! Well, I was politely waiting for someone to ask what it was all about. Like I wrote, I'm sure there's good stuff. To me, that was bad enough. Tiago, I got something even worse after we talked. To say I am upset would be a gross understatement. I know they do some good things. But the content I see right now is making me very sick.